Born in Philadelphia Pennsylvania on July 31, 1860 to a wealthy Quaker family, Mary took an interest in watercolor painting after graduating from the Friends Select School in 1879. When not working on the family farm, she would paint images of wildflowers she had seen on family vacations to the Canadian Rocky Mountains. There she also became interested in geology. In 1914, she married paleontologist Charles Doolittle Walcott, who was Executive Secretary of the Smithsonian Institution, at the age of 54. 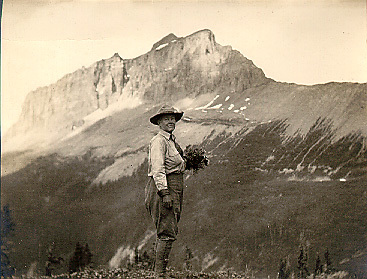 During their marriage, she often accompanied and helped him on his research expeditions, especially to the Canadian Rockies, where she continued painting wildflowers. In 1925, the Smithsonian Institute published approximately 400 of her illustrations in a five volume work called North American Wild Flowers. In 1935, the Smithsonian published 15 of her illustrations in this website's Index of North America Pitcher Plants. After her husband's death in 1927, Mary Walcott established the Charles Walcott Doolittle Medal in his honor, which is awarded for research on pre-Cambrian and Cambrian life and history. From 1927 to 1932, she served on the Federal Board of Indian Commissioners, and was elected president of the Society of Women Geographers in 1933. Mary Vaux Walcott died in St. Andrews, New Brunswick on August 22, 1940, at the age of 80. In Jasper National Park, Alberta, Canada, Mount Mary Vaux, located at 52°33'0N, 117°27'10W, is named after her.